Unwanted facial hair are probably appears due to the abnormal growth and is called hirsutism. Some individuals have over and dark growth of hair so they are said to be as hairier individuals. Their pigmentation of hair is dark or blonde hair. The unwanted hairs are found almost all over the body parts except of nails and eyeballs. Unwanted hair hides the beauty of woman and it is so embarrassing for her, especially for a working woman. This problem is suffered by a woman especially after the menopause when the levels of estrogen are changed. There are some common causes of unwanted facial hair growth such as polycystic ovarian syndrome (PCOS), hormonal imbalance, using of certain medications, adrenal gland disorders. Sometimes the cause of problem can be tumor or cancer of the adrenal gland or ovaries. Here we make you sure that do not use excessive medications and various harmful creams for removing the unwanted facial hair and try to follow the useful remedies we described here to solve this problem. This is a simple and amazing remedy for removing the unwanted facial hair. The unwanted hairs are easily removed from using the sugar wax. In a two tsp of granulated brown or white sugar, mix one tsp of each honey and of water. Heat the mixture in a low flame or you can heat in a microwave oven for half a minute until you notice the bubbles and the mixture turns brown in color. Now let the mixture cool down. With the help of spatula, apply the sugar wax only on the areas where unwanted hairs are present. Place the jeans fabric or wax strip over the wax and smooth it with your palm and fingers in the direction of the hair growth. Rip the wax strip in the opposite direction of the hair growth. You can make an easy chickpea flour face pack at your home. It will help in exfoliating your skin and remove the dead skin and so hair too. It will also act on the pigmentation of your skin by making it lighter tone. Chickpea flour is just a gram flour or besan. Take two tbsp of chickpea flour, one tbsp of milk cream and one-half tsp of milk and three quarter tsp of turmeric powder. Apply thick paste on the areas of unwanted hair and leave it for 20 minutes when it becomes completely dry. Now scrub it with using the facial loofah pad or a soft cotton cloth already dipped in lukewarm water. Do this daily for three or four times about a month. You will see the results after. Green gram flour is also used as a natural remedy for removing unwanted facial hair like chickpea flour. Combining green gram flour and rose water will act as a natural cleanser for acne skin. Mix one-half tbsp of rose water and two tbsp of green gram flour. You have an option to add one tbsp of lemon juice as well. Spread the smooth paste on the face and leave for 30 minutes. Do this for four times a week. Sugaring is a best and natural treatment for this purpose. Sugaring can be done on the body also. The procedure of sugaring is same as you do from the sugar wax. The procedure is painless and easy to apply. Take one quarter cup of water and heat it in a pan. Take two cups of granulated sugar and one quarter cup of lemon juice then mix them together and add in the pan and stir well. Heat it until the mixture show bubbles. Slow down the flame and let it simmer for 30 minutes so that you will see the mixture dark amber in color after. Take the pan out and allow the mixture to cool. Spread some baby powder or cornstarch on your skin. Spread the lukewarm sugaring mixture on your face in the opposite direction of hair growth. Place a clean cloth or wax strip on the sugaring mixture and let it sit for a few minutes. Pull it off in the direction of hair growth. Excessive growth of unwanted hair is usually caused by the excessive increasing in the levels of androgen hormone in the body. Spearmint tea is best for this purpose because it regulates the hormone levels. For making spearmint herbal tea, boil a cup of water. Add one tsp of dried spearmint in the water. Cover the container with the lid and let it simmer for 10 minutes. Strain it out and drink twice daily. An amazing mask can be made from lemon juice and honey. Because of the sticky nature of honey, it will help the unwanted hair stretching out from the face easily. On the other hand, the lemon juice will act as the cleanser and exfoliating agent. Honey contains moisturizing properties. Take four tbsp of honey and one tbsp of lemon juice then mix them well together. Apply directly on the face and leave for 20 minutes. Remove the mask gently with a washcloth dipped in lukewarm water. Follow this remedy twice a week for few months until you see the improvement. The remedy made by egg, sugar and corn flour is a great natural peel-off mask. It is beneficial for removing facial hair and contaminations from your skin. Take an egg and whisk it properly. Now add one tbsp of sugar and one-half tbsp of corn flour into it. 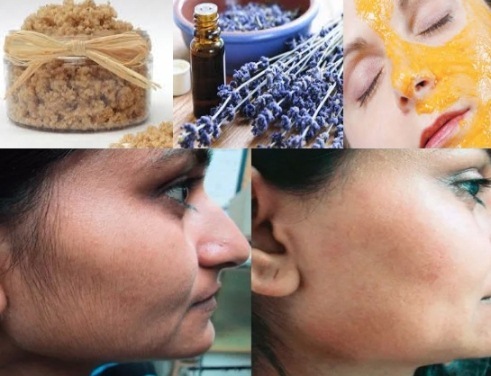 Apply this mixture on your face and let it dry for 30 minutes. Peel it off with the gentle hands. Repeat the remedy for four times a week. Lentil is commonly called masoor dal. You can make a natural face pack from lentils. It is a brilliant face scrub for removing unwanted facial hair. Take one half cup of red lentils and grind them in the form of powder. Add two tbsp of the milk and honey in the lentils powder to make a smooth paste. Keep it set for 15 minutes. Apply on the face and save the rest of the powder in the air tight container. Leave the mixture on the face for about 20 minutes. Follow this remedy three times a week. Turmeric is just like a neutral ingredient that can be combined with the number of other ingredients and is helpful for getting rid of unwanted facial hair. Take equal amounts of whole wheat flour and turmeric powder then mix them well together to make a powder. For turning it into a paste, you can add some sesame oil into it. Spread the paste on your face and set aside for half an hour before scrubbing it. Papaya acts as natural bleach and helps in lightening the unwanted facial hair. Squeeze out the pulp of raw papaya and mix one half tsp of turmeric powder in it. Massage your face with the gentle hands and leave it for 20 minutes.